The expanded C5 Credenza offering brings the aesthetics of the credenza to a more sophisticated level with High Pressure Laminate (HPL) and veneer finishes and new styles. 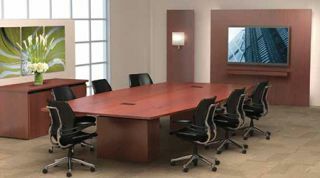 The credenza line addresses the migration of equipment enclosures into meeting spaces, and now enables the AV integrator to work more closely with commercial interior designers to grow their businesses and expand their customer base. Although this season’s Paris runways may have overlooked the allure of equipment racks and boxes, those of us in the industry understand the impact and importance of design for these products. A discussion of enclosure aesthetics should include the traditional equipment rack as well as technology-focused furniture, which is increasing in popularity for mounting equipment in conference, boardroom, and huddle space environments. More compact enclosures such as credenzas and technology pedestals now house smaller Codec devices, extenders and transmitters, network audio and video switches, and PCs, along with accessory shelves. FSR is designing table and floor boxes, to blend in with a room’s décor while still handling power, data, AV, etc. Capitalizing on this trend of furniture for meeting spaces that more fluidly blends with the environment is Middle Atlantic’s TechPed Series Technology Pedestal, providing localized and discreet equipment mounting. Providing under-table support while housing equipment and cables, it incorporates the company’s integrator-friendly Lever Lock smaller component management system, Troast said. Table, floor, and ceiling boxes represent another integral aspect of collaboration spaces that require power, data, and AV technology in discreet enclosures at point of use. Both technical requirements and space configuration are what drives design.